Controls the appearance of printed views and reports. Use this command to specify page orientation, margins, headers, footers, and legends. You can also specify options for printing sheet columns and for printing the Calendar. All settings you make apply to the active view. The name of the active view appears in the Page Setup title bar: for example, Page Setup - Gantt Chart. 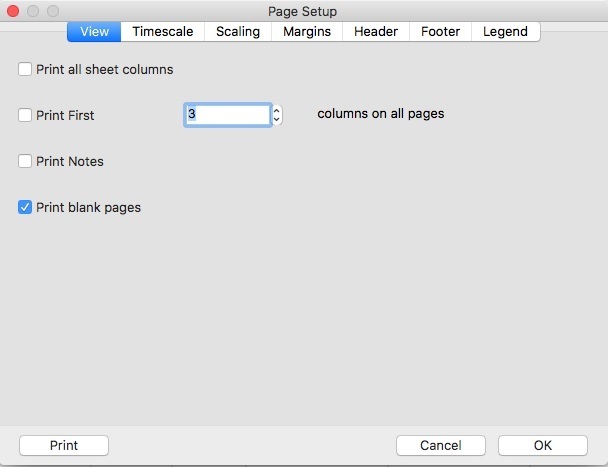 The following settings that you can made in Page Setup dialog are saved with your project, when the current view is Gantt Chart: Orientation, Paper size, Adjust to, Scaling, Fit to, Borders (on every page / none), Print first X columns, Print all sheet columns, Print blank pages, Print notes. This command displays a tabbed dialog box. Choose the appropriate tab for the kind of information you want to view or specify. Specifies page orientation and scaling options for printed views and reports. To see how your view or report will look when printed, use the Print Preview button. Select Portrait (vertical) or Landscape (horizontal). If the application cannot change the orientation for the selected printer, this option is unavailable. For new projects, the wider views (all except for those containing a grid only) have Landscape as the default orientation (i.e. Gantt Chart, Team Planner, Resource Usage). For imported projects, each view has the orientation it was originally saved with. Select the Adjust To option to reduce or enlarge the printed image size. 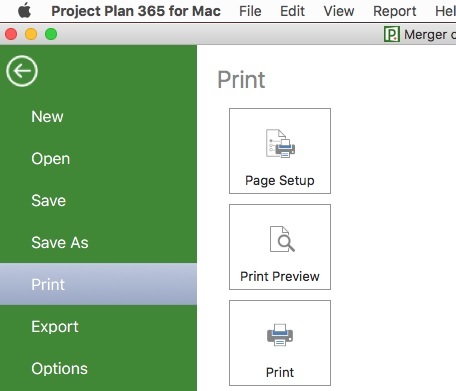 If you select this option, application automatically calculates the number of pages required to print the view, based on the number you enter. Type 100 if you don't want to reduce or enlarge the image size. 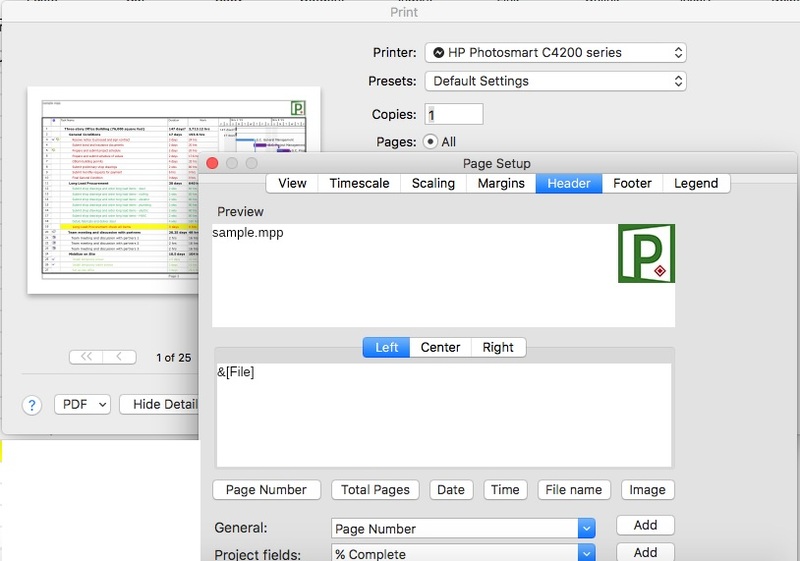 Choose the Print Preview button to see how many pages will be printed. Select the Fit To option to specify the number of pages across and the number of vertical pages that you want the view printed on. If you select this option, application automatically reduces the image size to fit on the number of pages you enter. In the Fit To option, you must specify the number of pages across and the number of vertical pages. You can only scale printed views on Postscript printers using Postscript printer drivers that support scaling. Specifies margins and borders for printed views and reports. Type the margin size you want. Select the border option you want. Specifies and formats page headers for printed views and reports. Shows how the header will look when printed. Select the Left, Center, or Right tab to specify the header's location on the page. You can type header text directly in the Alignment box, or you can use the buttons and list box to insert specific types of information. For example, to print the current date in the upper-left corner of each page each time you print the view or report, select the Left tab and then choose the button. The code & [Date] appears in the Alignment box and the current date appears in the Sample box. 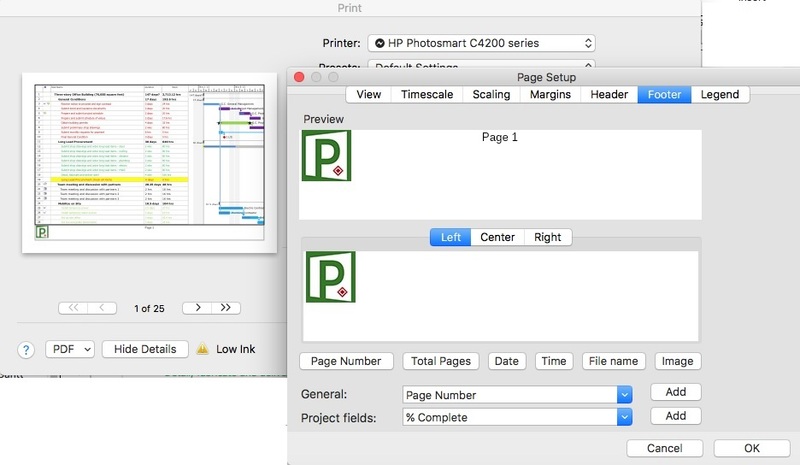 To print the company name at the top and center of each page, select the Center tab. Then select Company Name from the list and choose the Add button. The code & [Company] appears in the Alignment box and the company name appears in the Sample box. If you have not entered a company name in the Summary tab of the Properties dialog box, no name is displayed. Format Text Font : Opens the Text Styles dialog box, allowing you to select a font, font style, size, and color for the header text. Insert Page Number: Prints the page number on each page. Insert Total Page Count: Prints the total number of pages. Insert Current Date: Prints the current date. Insert Current Time: Prints the current time. Insert File Name: Prints the path and filename of the project. ​ Insert Picture: Allows an image to be printed inside the header of the current view or report. The image can be resized by dragging the sizing handles surrounding it. Adds the code for the selected item to the Alignment box. Specifies and formats page footers for printed views and reports. Shows how the footer will look when printed. Select the Left, Center, or Right tab to specify the footer's location on the page. You can type footer text directly in the Alignment box, or you can use the buttons and list box to insert specific types of information. For example, to print the current date in the lower-left corner of each page each time you print the view or report, select the Left tab and then choose the button. The code & [Date] appears in the Alignment box and the current date appears in the Sample box. To print the project manager's name in the lower-right corner of each page, select the Right tab. Then select Manager Name from the list and choose the Add button. The code & [Manager] appears in the Alignment box and the manager's name appears in the Sample box. If you have not entered a manager's name in the Summary tab of the Properties dialog box, no name is displayed. Insert Picture: Allows an image to be printed inside the footer of the current view or report. The image can be resized by dragging the sizing handles surrounding it. Specifies and formats a legend for the Gantt Chart and Calendar. Shows how the legend will look when printed. Select the Left, Center, or Right tab to specify the legend's location on the page. You can type legend text directly in the Alignment box, or you can use the buttons and list box to insert specific types of information. To print the project manager's name at the bottom right of each page, select the Right tab. Then select Manager Name from the list and choose the Add button. The code & [Manager] appears in the Alignment box and the manager's name appears in the Sample box. If you have not entered a manager's name in the Summary tab of the Properties dialog box, no name is displayed. Format Text Font: Opens the Text Styles dialog box, allowing you to select a font, font style, size, and color for the header text. Select the Every Page option to print the legend on every page. Use this option when plotting or printing on large paper. Select the Legend Page option to print the legend on a separate sheet. Use this option when plotting or printing on small paper. Select the None option if you don't want to print a legend. Type the width for the legend text area. You can choose a width between 0 and 5 inches or 0 and 10 centimeters. To specify centimeters rather than inches, choose the International icon in the Windows Control Panel, and then select Metric in the Measurement box. Specifies options for printing views that contain sheets, such as the Gantt Chart and Resource Usage view. Select to print all columns of a sheet in the view. Clear this option to print only the visible columns. For example, your Gantt Chart might have only two visible Gantt table columns. If you select this option, all columns will be printed. If you clear this option, only the two visible columns will be printed. This option is available only for views with a timescale. Select to print a specified number of columns on all pages, where (number) equals the number of columns you want to print. If you have a project that prints on multiple pages both horizontally and vertically, the pages that encompass the left edge of the project will show the number of columns that are visible in the Gantt Chart, no matter what number is specified in Print First (number) Columns On All Pages. However, all other pages will show the number of columns you specify. Select to print all task and resource notes. The notes are printed as a group after the view or report has been printed. Select to print the pages in a view or report that don't contain data - for example, in a large Gantt Chart. This option is not available for the Resource Graph, Task Sheet, Resource Sheet, or Calendar. In the Calendar view, it specifies options for printing the Calendar, including the number of months, whether to include a list of tasks whose bars are not displayed in the Calendar. To see how your selections on the View tab will affect the printed calendar, use the Print Preview button. Select the Months Per Page option button and the 1 or 2 option button to print one or two months on a page. Select the Print Calendar Title check box to print the monthly calendar title at the top of each page. You specify the monthly title on the Week Headings tab in the Timescale dialog box. Select the Show Additional Tasks check box to print a list of the tasks whose bars are not visible in the Calendar. Then select the location where you want these task names to appear. Page Setup is available on File menu under Print. Controls the appearance of printed views and reports. Use this command to specify Print all sheet columns or Print first x columns, Margins, Timescale, Scaling, Header, Footer and Legends. You can also specify options for printing sheet columns and for printing the Calendar. The following settings that you can made in Page Setup dialog are saved with your project, when the current view is Gantt Chart: Print first X columns, Print all sheet columns, Print blank pages, Print notes , Timescale(Dates from date to date), Adjust to, Scaling, Fit to, Margins (on every page / none), . Print All Sheet Columns: Select to print all columns of a sheet in the view. Clear this option to print only the visible columns. For example, your Gantt Chart might have only two visible Gantt table columns. If you select this option, all columns will be printed. If you clear this option, only the two visible columns will be printed. This option is available only for views with a timescale. Print First (number) Columns On All Pages: Select to print a specified number of columns on all pages, where (number) equals the number of columns you want to print. This option is available only for views with a timescale. Print Notes: Select to print all task and resource notes. The notes are printed as a group after the view has been printed. This option is available only for views with a timescale. Print Blank Pages: Select to print the pages in a view that don't contain data - for example, in a large Gantt Chart. This option is not available for the Resource Graph, Task Sheet, Resource Sheet, or Calendar. To see how your view or report will look when printed, use the Print button then all changes will be available in Preview section. The Timescale related options are available if you are printing the Gantt Chart, Resource Graph, Resource Usage view, or Calendar. Select All to print the project from start date to finish date. To print the project only between specified dates, select Dates and enter the start and finish dates in the From and To boxes. Note: In the Fit To option, you must specify the number of pages across and the number of vertical pages. Specifies margins and borders for printed views. Top, Right, Bottom, Left: Type the margin size you want. ​ Insert Image: Allows an image to be printed inside the header of the current view or report. The image can be resized by dragging the sizing handles surrounding it. Insert Image: Allows an image to be printed inside the footer of the current view or report. The image can be resized by dragging the sizing handles surrounding it.